Redbird Arena seats 10,500 people and is home to both men’s and women’s basketball and women’s volleyball. Redbird Arena hosts many entertainment events such as concerts, outdoor shows, and antique and craft shows. 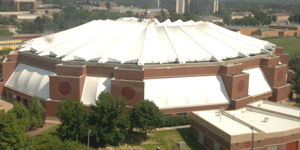 Redbird Arena opened in 1989 and contains 24 teflon-coated, fiberglass fabric panels for the roof. It is the second largest university arena in the state, with a portable wooden floor placed over a concrete deck with lower seating which can be folded back, and special lighting arrangements for stage productions. The facility includes comfortable locker rooms plus full-service training and strength facilities just a few steps away. Redbird Arena’s uniquely-designed roof is a key to its bright appearance, inside and out. The 65,000-square-foot, low-rise cable dome features reinforced exterior fabric. It rises 31 feet above a steel-reinforced concrete tension ring which encircles the top of the 12-sided roof peaking at 100 feet above the floor. The glow from the Teflon-coated roof on game night has inspired references to Redbird Arena as the "Crown Jewel" of athletics facilities. From tickets to concessions —and every service in between —dedicated people put fans first and contribute to Redbird Arena’s classy reputation as clean, safe, and convenient. Whether it’s hosting conference tournaments, NCAA events, or high school championships, Redbird Arena has proven equal to the highest standards or capable of setting new ones. Spring Commencement 2019. Please refer to GraduationServices.IllinoisState.edu for more information. Identify internship and full-time employment opportunities, or just network with employers. Winter Commencement 2019 Dates and times are tentative. Please refer to GraduationServices.IllinoisState.edu for more information. Spring Commencement 2020 Dates and times are tentative. Please refer to GraduationServices.IllinoisState.edu for more information. Winter Commencement 2020 Dates and times are tentative. Please refer to GraduationServices.IllinoisState.edu for more information. Spring Commencement 2021 Dates and times are tentative. Please refer to GraduationServices.IllinoisState.edu for more information.